We are excited to announce the release of a new fact sheet that highlights results from Advance CTE’s 2017 Perkins Implementation Survey. 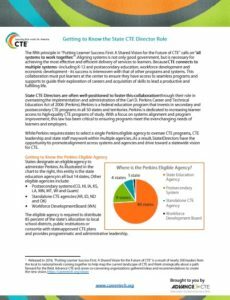 Responses to this survey demonstrated that State CTE Directors’ portfolios cover a range of responsibilities, and that there are additional factors to consider when understanding the variety of responsibilities that fall into the portfolio of a State Director. State Directors are often well positioned to promote collaboration across programs and systems because of their role in the implementation and administration of the Carl D. Perkins Career and Technical Education Act of 2006 (Perkins). In all but 14 states, the Perkins Eligible Agency is the State Education Agency. Some responsibilities, such as overseeing secondary CTE, are shared by most State Directors, but overall there is large variation in the State Director role. Check out the full fact sheet to learn more about the responsibilities of the State Director, what factors might impact this role and how this can promote cross-system collaboration. This entry was posted on Thursday, June 7th, 2018 at 7:16 am	and is filed under Uncategorized. You can follow any responses to this entry through the RSS 2.0 feed. Both comments and pings are currently closed.